[tps_footer]Akshay Kumar is busy with his upcoming film Housefull 3 promotions and is seen having fun at all the promotions. And recently we saw him having fun with Siddharth Malhotra. The two were snapped together and posed for the camera too. Siddharth and Akshay have done Brothers film together. 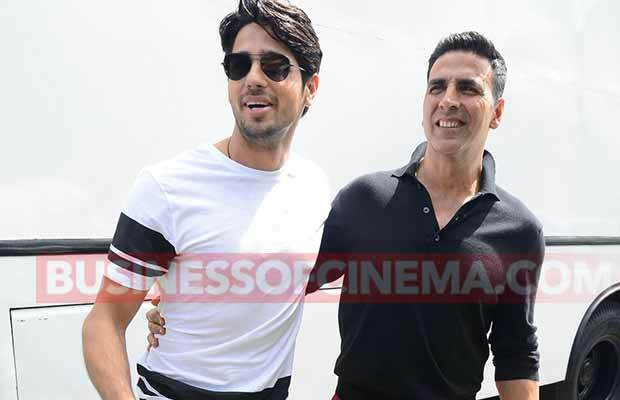 Akshay considers Siddharth as brother from other mother. While Siddharth busy shooting for Baar Baar Dekho with Katrina Kaif. We really want these two brothers to do a movie together. They both share a good equation and that is clearly evident from their pictures. Both of them very looking quite charming. While Akshay opted for red pants and black t-shirt, Siddharth kept it classy with White t-shirt and denims. What do you think about these two actors tell us in the comments below. Next articlePhotos: Preity Zinta-Sussanne Khan Bonding Over Dinner!